YouTube is one of the most popular search engines in the world. Millions of videos are watched every day across the Globe. People watch YouTube videos for entertainment, to clear their doubts and gather information. We can find Some haters leave negative comments on your Video, at that time we should hava an idea on How to respond to Negative YouTube Video Comments. Because of the large numbers of audience, creating videos and uploading them to YouTube channels has become one of the best options to make money. Some YouTubers are earning good money with YouTube videos. Vloggers need to engage with the audience and build a community to develop their YouTube channels and get more views for their videos. For this, they have to get feedback from the audience. The comments in the video give the insights of how people are responding to the videos. These comments also help to improve future videos. However, the viewer’s comments are always not positive. There are high chances that the YouTubers encounter negative comments also and they inevitably have to deal with them. Handling them is a bit difficult but one has to learn how to do this. 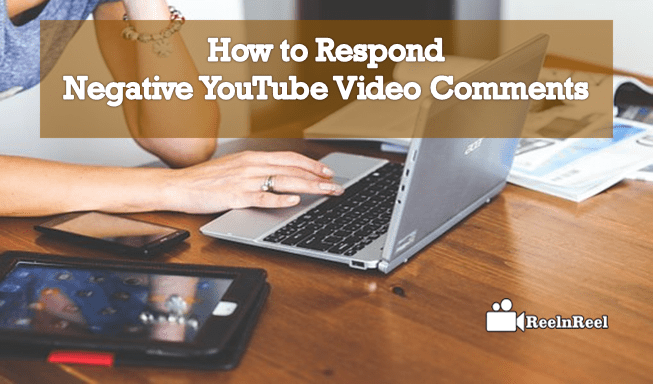 When encountered with a negative comment, vloggers should learn to ignore it. Even if they want to reply, they should never say anything hateful. Ask for the suggestion to improve the future videos. This can create a positive feeling in the mind of the person, and he can genuinely give some advice. A negative reply can damage the reputation, and if the person who made the negative comment only wants attention, he might even use vulgar language. If this happens, ignore them or delete the comment. Almost every YouTube experiences troll attack. Every YouTuber is bound to get negative and hurtful comments. Online trollers try to hurt the feelings of people and to start a fight. YouTubers should never fall for the bait. Simply ignore the comment. If the person continues to pester, block the person and move on. Negative comments can be constructive feedback sometimes, so learn to focus on such comments and use them to improve the channel. Focus on the positive comments that appreciate the hard work. If the YouTube videos are disliked for a legitimate reason, try to fix it. Acknowledge the mistake or criticism and try not to repeat it in the next videos.Do not simply delete the negative comments with legitimate reasons. This can backfire, and the audience might feel that fixing the issue is not on your mind and you do not care about how your viewers are feeling about the videos. The Internet is the place full of trolls. These trolls target YouTube videos with lots of views. The only goal of the trolls is to hurt or make the vloggers angry. They use offensive language. Trolls look for attention, and so they use every tactic to make you respond and get entertained by them. On the other hand, not all the people who leave negative comments are rolls. This can be because of their poor communication skills. It is thus essential to differentiate and respond. While dealing with trolls, do not use any emotional language. It is not advised to respond to trolls, even when responding keeps them dry and factual. Maintain calm and unaffected tone. Trolls will post the same comment on any YouTube video they watch. This is not limited to some YouTuber. Every one of them gets them. These comments are not for the content of the videos or the hard work of the YouTuber. These only reflect the person who is writing them. Staying confident and focusing on creating great content is essential. Pay attention to the positive aspects and spend valuable time to interact with the supporters. Do not respond to negative comments with no legitimate reasons. Silence is the best answer for trolls. Do not feed the negativity as this is what they want to they get entertained by the responses. Some people only want attention and do all sorts of things to get it. They find trolling as one of the better ways to ask for care. So learn to ignore them completely. Think of the positive feedback you are getting. Set time to read comments to avoid wasting time arguing with trolls. Do not allow negative comments to affect your mood. Most mature way to deal with negative comments on YouTube is to ignore them, even if you want to defend. If the comment is offensive, delete it and give the message that the channel is no tolerance zone. There are effective ways to respond to rude comments on YouTube. Do not pay more attention to them as there are supportive and positive comments also. Delete the negative comments, block the commenter or respond positively and try to obtain clarification. Find the best way to use in the current situation. Disabling comments likes and should be the last option for the vloggers. However, this can end up the video ranking lower, and people might stop sharing it. This can badly hurt small YouTube channel and business channels. Thus this should be only the last resort. Getting negative feedback from the audience cannot be escaped. Learn thing that helps to take control of the videos and the negative comments on YouTube.